What is a "Member Of The Year"? 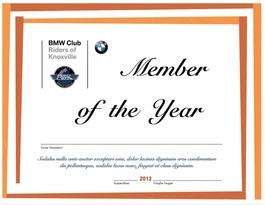 The Member Of The Year is a very special BMWROK Club member: a MOTY-cyclist! The MOTY Award will be presented annually at each January Club meeting to the member who has accumulated the most points during the past year. It is intended to be an incentive, encouraging member participation at meetings, monthly rides, club sponsored events, etc. The award will be a plaque or some sort of hardware, free club membership for the next year, and possibly some monetary prizes such as gift certificates or discounts that dealerships may sponsor. (The BMWROK Ride CoOrdinator will be soliciting participation from dealers.) The Ride CoOrdinator will keep track of the points based on input provided by leaders of rides, rallys and events. The sign-in sheet that is passed around at monthly Club meetings is another source of input, so make sure you sign-in at our meetings! Attend Monthly Meeting . . . . . . . . . . . . . .
Ride to Monthly Meeting . . . . . . . . . . . . . . Monthly Ride(s) Participation (each) . . . . .
Lead a Monthly Club Ride . . . . . . . . . . . . . Club-sponsored event participation . . . . . BMWROK Club Rally . . . . . . . . . . . . . . . .
Overnight Ride participation . . . . . . . . . . .
Lead Overnight Ride . . . . . . . . . . . . . . . . . Submitted by our Ride CoOrdinator, who can be contacted here.